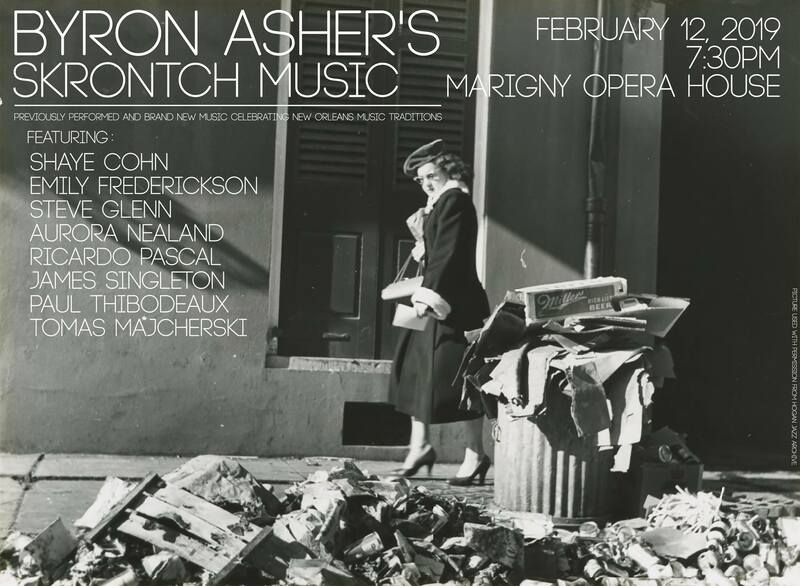 Skrontch Music is an ongoing composition project led by multi-instrumentalist Byron Asher that investigates the history and lineage of New Orleans music in its social and political context through contemporary jazz composition and collective improvisation. The initial Skrontch Music suite was premiered in 2017 and explores the intertwined histories of New Orleans jazz and anti-Jim Crow activism in the early twentieth century. Asher worked on the piece during a 2017 Flint and Steel Residency at A Studio in the Woods. At the Marigny Opera House, the Skrontch ensemble will perform the original hour-long composition as well as a second set of brand new music. Featuring Shaye Cohn, Emily Frederickson, Steve Glenn, Tomas Majcherski, Aurora Nealand, Ricardo Pascal, James Singleton, and Paul Thibodeaux.